Insta Golf Shoes are high quality, durable, pull on golf spikes that fit virtually any shoes and are available in sizes to fit almost all shoes. Insta Golf Shoes are constructed of rugged Thermoplastic Elastomer or TPE, which firmly grabs the toe and heel of any shoe you choose to wear. For the traveling golfer, Insta Golf Shoes make packing easy. They arrive with a custom travel bag which may be reused for storage and travel. Simply wear your favorite shoes and stick your Insta Golf Shoes in your golf bag where they will take up very little space. Full foot slip protection with heel and forefoot cleats maintains traction throughout your natural stride while walking or swinging. Lightweight TPE Elastomer holds Insta Golf Shoes securely in place. 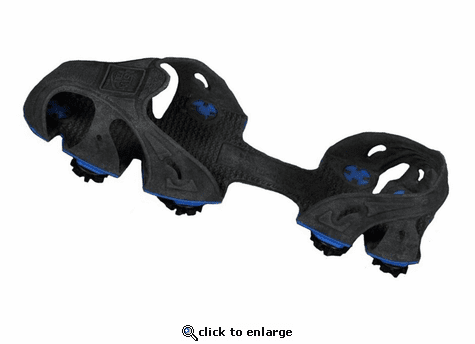 Traction tread outsole and cleats contact walking surface, providing superior traction and stability. Long-wearing, replaceable golf cleats save money. Whether you are playing the sunny fairways of Florida or the ocean lids of northwest Ireland, the Insta Golf Shoes\xBB will provide you traction and stability. An aggressive cleat and tread combination creates the mobility and traction you need to stay on your feet and safe during your golfing journeys. Engineered to be lightweight with Tension-Fit Binding, Insta Golf Shoes hold securely to your favorite sneakers, as well as most your casual footwear.